I just want to be sure you’ve considered all our options. Because people who shoot at you usually wind up shooting at me, too. Captain America: Civil War is two and a half hours long, and they fly by. That’s an accomplishment in and of itself, in this age of the bloated superhero epic (even Joss Whedon was not immune), that a film with massive action setpieces involving roughly 300 characters feels…lean. Or maybe “lean” isn’t the right word. It feels right. It feels like the Brothers Russo, along with screenplay wizards Christopher Markus & Stephen McFeely, clearly obsessed over keeping it all in balance, and character-driven, and emotionally rich, and technically audacious, and rhythmically satisfying, and they nailed it. They nailed just about everything. I wrote in my Age of Ultron review that the best way to think of this ongoing saga, or really, comics in general, is as modern American myth-making. Where mankind once gathered in halls and around fires to recount the adventures of Hercules or Arthur, now it’s these superpowered heroes, in interlocking tales with varying regard for continuity, that serve as the avatars for our ideals. I sometimes wonder how future generations will look back at this decade-plus, War-on-Terror Era onslaught of comic properties: like we do the alien invasion (Red Scare) flicks of the 50s? The macho-‘Murica action films of the 80s? Or just as a brief season in Hollywood history where a lucrative development plan was discovered and eventually beaten into the ground? Some of these films are dreck, of course. But the good ones tap into something almost primal, or even spiritual, about our need for a heroic, self-sacrificing protector. The great ones go even further, and present those protectors as good but recognizably flawed people, with their own desires, and explore the conflict that comes when those two ideas don’t line up. The best ones, however, force well-developed characters into corners that they can’t just punch their way out of. The conflict isn’t only physical, but intellectual. Batman vs. The Joker in The Dark Knight isn’t a war of gadgets and machine guns, but of philosophies. Of worldviews. Characters drive Story — Plot is just stuff that happens to the characters. And the best storytelling occurs when the writers succeed in pulling the old Debate Team trick of making a convincing argument for the other side. You have to give your protagonists a choice, after all. And if the choice is clear, then it’s not interesting. That’s Writing 101, man. Captain America: Civil War, an Avengers film in everything but name, is one of the best ones. And it’s exhilaratingly fun, to boot. After the events of Ultron, taken together with the host of disasters that Steve Rogers (Chris Evans), Tony Stark (Robert Downey, Jr.), and the gang have contributed to/inadvertently caused, over a hundred countries around the world have decided that they’re no longer in favor of “enhanced” individuals operating with complete autonomy. The thrust of Civil War‘s plot revolves around the Sokovia Accords (named after — you know what, if you don’t know, there’s no point), which will put the Avengers under the direct oversight of an international panel. While that, on its own, is not super exciting, the reason why Civil War works is because it takes what we’ve learned about these characters over the last several years and follows this idea to its logical conclusion. Stark, for one, thinks the Accords are necessary because he doesn’t trust himself to make the right decision. Natasha/Black Widow (Scarlett Johansson) doesn’t love the idea, but sees it as a necessary compromise to stave off an even worse, more oppressive situation. Even Vision (Paul Bettany) has done the mental calculus and concluded that they should sign for the greater good: “Our very strength invites challenge,” he argues. “Challenge incites conflict. And conflict… breeds catastrophe.” In other words, the more unstoppable the Avengers are, the harder they’ll have to fight, and the more people die. It’s okay with Steve for the Avengers to be the world’s policemen because their motives are pure, but he can only really speak for himself. He doesn’t want to be in a position where he’s barred from intervening, or worse, sent somewhere he doesn’t want to go…but on the other hand, how many innocent lives is that freedom worth? To make matters worse, his old friend the Winter Solder, née the brainwashed Bucky Barnes (Sebastian Stan), has just been accused of committing a few more terrorist crimes, and Steve isn’t about to let him be shot on sight without trying to find out if there’s a greater conspiracy afoot. Batman v. Superman: Dawn of Justice tried something similar (in basically looking at the comic film genre as a whole and saying “wow, maybe there should be consequences for all this wanton destruction”), but it was handled in the most unsubtle, obnoxious way possible because Zack Synder is incapable of nuance on any level. But here, the Russo Brothers (who joined the Marvel stable with the superb Winter Soldier, and will see this generation of heroes to the end in the Infinity War two-parter) not only get to have these philosophical conversations in which everyone is at least partially right, but they do it with a lightness of touch and fleetness of foot. The film moves, baby. And, despite its heavy themes and emotional wreckage on display in the final reels (quick aside — Downey, Jr. is actually acting, for maybe the first time this series, and it’s great), it is every bit the unabashed entertainment that DC’s grimdark releases are not: witty and loose and altogether gratifying. And I haven’t even mentioned yet the most wonderful thing about the film. Not him, but he’s great, too. The ever-expanding roster include all the players in Ultron save Thor (who, not being of Earth, probably doesn’t care about our politics) and Hulk (last seen taking a jet into the unknown), but that doesn’t stop Markus & McFeely from introducing a few more, and it’s only through exceptional casting and great economy that it doesn’t feel overstuffed or incomprehensible. 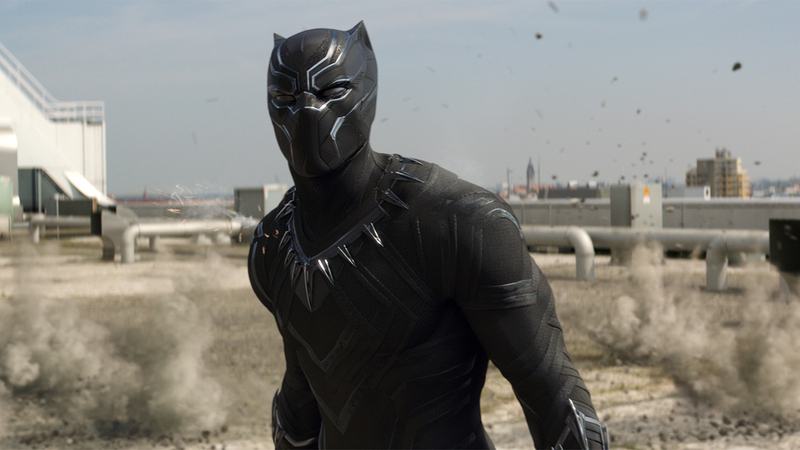 We meet T’Challa, the prince of Wakanda, who moonlights as the Black Panther: a Zorro-esque vibranium mantle passed down, in his culture, from warrior to warrior. Chadwick Boseman, last seen as the only dude having any fun in the execrable Gods of Egypt, plays T’Challa with the regal bearing and feline grace he deserves. He quickly signs on to Team Iron Man, for reasons personal as well as political, even though his presence in the plot is little more than a preview for his own standalone film (directed by Creed‘s Ryan Coogler!) coming next year. Again, it works. On the domestic side, William Hurt joins Robert Redford and Michael Douglas as “Hall of Fame Actors Who Just Couldn’t Resist;” he plays Secretary Ross, who gives the Avengers the take-it-or-leave-it offer that sets things in motion. Martin Freeman pops up for a couple of humorous scenes, and Daniel Brühl circles the narrative as Zemo, ostensibly the villain, whose true motives remain bafflingly unclear right up until the climax. He’s fine, but unmemorable, which is partially the point. Paul Rudd’s Ant-Man gets ported over for the centerpiece airport showdown and gets several of the best gags, which is the best way to use Paul Rudd and Ant-Man. Zero complaints there. 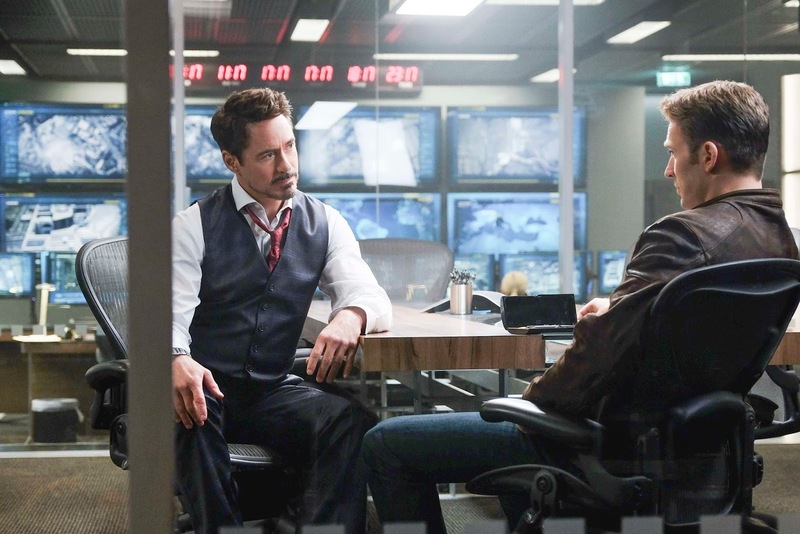 No, the lasting image of Civil War is not Captain America and Iron Man locked in combat, or any particular Bourne-inspired shakey-cam shot within the film’s globetrotting narrative, nor Vision in a sweater (alas! 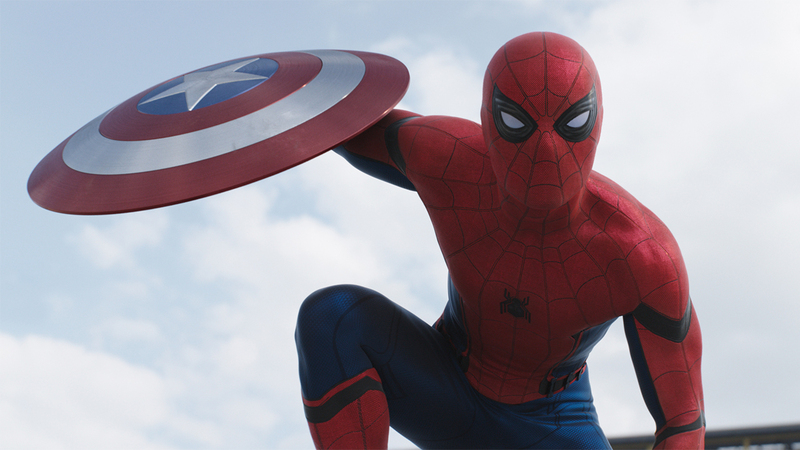 ), but — against all odds — Tom Holland’s Amazing Spider-Man. I watched the excitement explode across the internet like a megaton bomb when the webslinger cameoed in that first trailer, but my heart-of-hearts reaction was a quiet “well, this just clears a very low bar.” The truth is, I have never cared that much for Spider-Man or his troubles. Spider-Man 2 is fine, but the others bored me, and I was out on the Andrew Garfield editions the moment I heard they were just doing the origin story yet again. So, thanks to the incredibly endearing Holland and some genuinely smart writing, Civil War has me excited about a Spider-Man film for the first time ever in my life. Watching Peter Parker and Scott Lang geek out about being included in the airport brawl, and how they make the most of their opportunities (I won’t give away any of the jokes, but they are constant, and they are perfect), encapsulates the joyfulness of the whole affair, as much as the sequence serves as a master class in how to stage an ensemble fight with crystal clear geography and motivations. The Russos aren’t going to get enough credit for how technically accomplished their films are, how smoothly it all fits together, because the Marvel “House Style” is so predominant. It’s easy to take this level of polish for granted, but trust me, and Whedon can attest: this is hard. With so many competing interests and franchise obligations to keep spinning (and that’s without adding the Guardians and Doctor Strange to the mix down the line), the increasing serialization — TV-ization — of film is not without its detractors. This is our new reality, where every intellectual property that can get a shared universe will get one, and few if any of these films truly stand on their own. Singular experiences are rare, when everything is either a sequel or a prequel or a side-quel, and some of them pack in enough plot to feel like you just binged on the new season of a Netflix series (and we’re still doing that, too). But, to go back to that film school well one last time, it doesn’t matter how it works, or what rules it breaks, if it works. And Civil War works like gangbusters.